Subject: QOTD DEC 5: If you could play an RPG at any place in any current time or in the past, where would you play and why would you want to play there? If you could play an RPG at any place in any current time or in the past, where would you play and why would you want to play there? I would play in an Egyptian tomb and lengthily explain our game to the people decorating the place. Possibly involve the owner while he still lives. Then I would go back to my time and couch, and happily watch a TV doc about the strange scenes and pictures on the walls of a recently unearthed tomb. more seriously, I would ask for a first-class ticket on a 1920s liner and spend two weeks playing on the Atlantic, or even longer on the Pacific. This has turned out to be a thought provoking question for me. I wasn't ready to think this early. I'd go back to my parents' basement any of those bajillion times we played Talisman instead of an RPG. Two reasons. First, while we had fun with Talisman back in the day (take a drink), it's a pretty terrible game. Sure, sure... hindsight is awesome. Second, those were my opportunities to run something. My bad habits formed early. I would lose confidence in the games I was running and would bail. If, instead, I had forged ahead and run more stuff, well, with practice comes confidence. How would you determine dice rolls?! I would go back to when Nigel Findley was still alive and play Shadowrun with him because he was one of the original writers. Bah, nonsense! How would you determine dice rolls with actual dice, like RPGs are meant to be played?! One word. Magnets. Ok, two more... Metal Dice. Use magnetic dice near a metallic surface (or the opposite). Spin the die in the air before blowing it softly toward the panel. I'd go back to my parents' basement any of those bajillion times we played Talisman instead of an RPG. Yeah, my immediate thought was to go back and run something for my younger self. Like a lot of folks, I kind of learned how to play RPGs in tandem with my friends, and we didn't have anyone else to model what other possibilities there were for that kind of play. There's value to that, too, but it would have been nice to see what a focused and, uh, socially functional game looked like. I have a nostalgia for a time before I was old enough to experience things (I'm 31). I'd like to go back to the early days of DND and experience it in that form. That pure dungeon exploration, no frills state without the knowledge or want for the full story. To see what it was like firsthand. To take it a step further, playing in a game with Gygax and Arneson would be wild. Especially to get to explore these places we've heard about but that never made it to press as a fully compiled adventure/map. 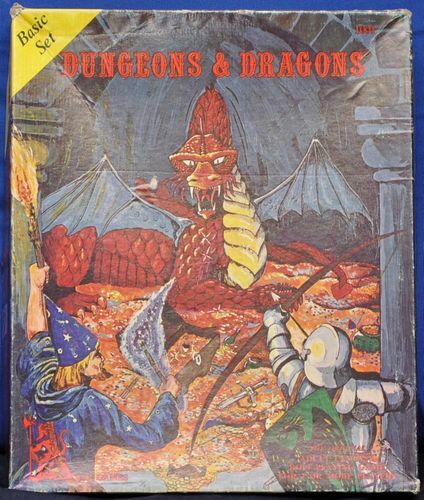 Back to the early 80s into the basement of the guy who got me into RPGs. Where the pool table rails kept our dice from rolling onto the floor, and the felt surface protected the dice’ edges and miniature’s paint from chipping. When we didn’t know all of the various monster’s stats & weaknesses, and hadn’t yet been told that we were “doing it wrong”. Before the time when members of our merry band dispersed to different cities and countries, or reached the farthest shore. Probably on the wide deck of the Ark after it'd stopped raining. All the jerks were dead (hence, not in the game). Probably a nice, glassy sea. Nothing to do but float around for a long time - no distractions - do the game. Probably a good breeze to keep the animal stink wafted away. With all due respect to RPGers, if I could be any place at any time, I wouldn't be playing an RPG there. At Jack Chick's house, but only if I could have some of my Catholic and Mormon friends play with me. In a quiet smokey bar in Cuba surrounded by tables of old men playing dominoes. I just finished my novel and am reminiscing with old friends from School after a full day fishing for drum. I light a Cohiba, and down my second shot of Añejo, pull out paper, pencils, rule book, and a leather bag of dice and exclaim..."Gentlemen, it's time to get our mental juices stirring with a session of Call of Cthulhu. The place, Cairo, 1924. You are all mulling over a small papyrus that little Hadyid delivered to you from the latest dig. One of you notice the symbol of Krang. Impossible, you think...and go.". Your fiends smile and I order another round. It's going to be a good evening. Never heard of it. Is there a Kickstarter or something? I'd love to play an RPG with HG Wells. I think 1889 would be right up his alley thematically. So might Star Wars; I know the idea of dice shaping a story isn't entirely outside his phronema based upon how he relates the results of playing miniatures games. Steel dice spun and landed on a magnetic plate. I like the current amount of gaming I've been doing - though I would like work to be slightly less busy so I have more time to post during the day (I'm at work right now, sadly).